After being out of town last week to visit family in Oklahoma, I was ready to get back to our regular routine at home. Then reality hit and I remembered that a regular routine only occurs in my fantasy life. For example, yesterday involved a swim practice, an unscheduled visit to the orthodontist for a broken retainer, a trip to the car service center for a check engine light that came on, and a run to the grocery store by bicycle due to the car being in the shop most of the day and the need for fresh groceries after being gone for a week. Yeah, that is more my real life. Honestly, cooking and photographing was the easiest part of my day yesterday. 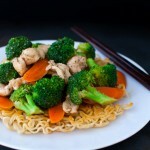 Since I was making this chicken and vegetable stir-fry, cooking was especially easy. Learning to make a stir-fry was the first recipe my mother taught me to cook when I graduated from college and moving into my own apartment. I have made so many stir-frys now that I do not measure the ingredients anymore. I was careful to measure everything out when I made this yesterday but you should really use the recipe more as a guide. I kept it simple with broccoli and carrots since I always have those on hand and my kids will eat them without any fuss but you could also substitute in green beans, snow peas, bell peppers, mushrooms, or spinach. I like to slice the carrots at an angle to get somewhat thin long slices. My mother likes to cut her carrots into 1 inch pieces, cutting the thicker pieces in half or quarters. You can also use shrimp, beef or pork instead of chicken. Or omit the meat entirely, if you want something vegetarian. And let’s not forget the noodles. Why do fried things have to taste sooooo good? Usually, I am perfectly happy to serve stir-fry over white or brown rice but a few weeks ago I was in the mood for something different. I happen to have some extra time (and energy) so I used the opportunity to fry up some noodles. And they were good – really good. So good in fact that I may have a hard time going back to eating rice with my stir-fry. Granted if you have had a long day or are coming home late from work and needing to get dinner on the table quickly, I would suggest skipping the crispy noodles and just going with the rice. But if you want to indulge, go with the crispy noodles. In my fantasy life, I have crispy noodles all the time. Boil 4 cups water in a saucepan. Add noodles and cook 3 minutes or until noodles are soft, stirring occasionally. Use a fork or chopsticks to separate the noodles. Drain noodles. In a large cast-iron skillet, heat 1 tablespoon oil until hot. Add noodles and arrange into an even layer. Drizzle 1 tablespoon oil over the top. Let the noodles cook undisturbed until the underside is lightly browned, 8-10 minutes. Adjust the heat if noodles start to brown too quickly. Shake the skillet occasionally to prevent the noodles from sticking and add more oil if necessary. To cook the other side, use a spatula to loosen the noodles and slide them out of the pan and on to a plate. The noodles should be cooked together and slide out like a large pancake. Invert another plate on top of the noodles. Hold both plates tightly together and flip the noodles over. Add another tablespoon of oil to the pan. Use a spatula to transfer the noodles back to the pan. Cook until the underside is lightly browned, 8-10 minutes more. To get the noodles extra crispy, put the skillet in the oven and bake the noodles in a 350 degree oven for 10 minutes. Mix together ground pepper, celery salt, granulated garlic, and ground ginger in a small bowl. Sprinkle spice mixture over chicken and stir until chicken is evenly coated with spices. Add sesame oil and mix until chicken is evenly coated with oil. Set aside. Heat 1/2 tablespoon canola oil in a medium sized wok over medium-high heat until oil begins to shimmer. Add garlic and stir until garlic is fragrant and starts to brown. Remove garlic from pan and discard. Rotate and tilt pan so that oil evenly coats the bottom and sides. Add chicken in an even layer around the wok. Let the chicken sit a minute or so until it starts to brown. Then stir the chicken and let cook until lightly browned all over and chicken is just cooked through. Add in oyster sauce and stir until the chicken is evenly coated. Transfer chicken to a a clean bowl or plate. Add remaining 1/2 tablespoon of oil to the pan and return to medium-high heat. When oil begins to shimmer, add broccoli and cook 1-2 minutes, stirring occasionally. Add carrots. Cook vegetables, stirring occasionally, until lightly browned, about 3-5 minutes. Add vegetable broth and bring mixture to a simmer. Cover pan and let vegetables cook until tender-crisp, about 3 minutes. Uncover pan, add chicken and any accumulated juices back to pan. Stir to combine. Stir cornstarch mixture to re-combine and add to pan. Bring mixture to simmer. Cook until sauce thickens slightly. To serve, using a knife or your hands, divide the noodles among four plates. Top with chicken, vegetables and sauce from the pan. Serve immediately. To cut chicken, slice the breasts across the grain into 1/4 inch thick strips. For larger pieces, cut the strips into 3-4 pieces so that all the chicken pieces are approximately the same size. To save getting yet another pan dirty, I boil the water and cook the ramen noodles in the wok. After I drain the noodles, I wipe out the wok with a paper towel and use it to cook the stir-fry.